A great way to learn more about local food culture is to go on a guided tapas tour. 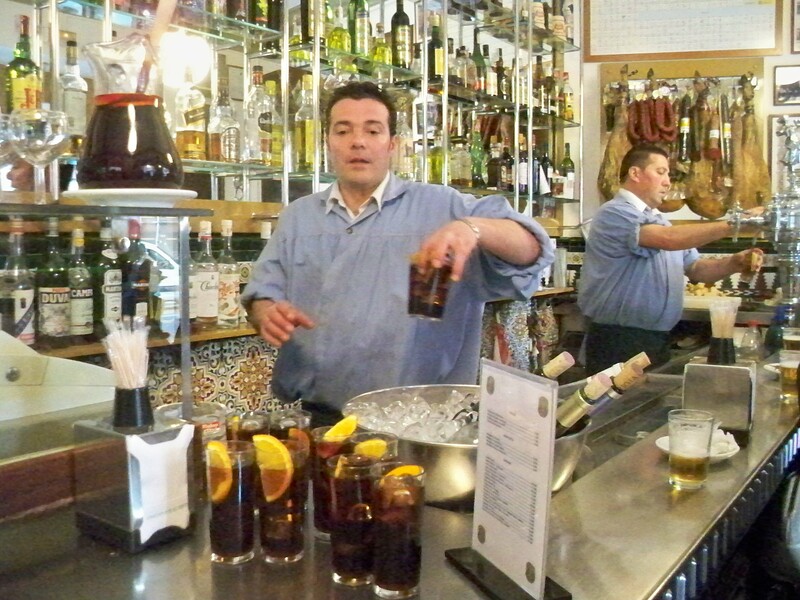 There are several available in the city but one of the best is the Old Madrid Tour run by Andres Jarabo. Andres is a local (unlike many of the other guides) and is a member of the Spanish Wine Tasting Association. The tour takes in four stops and includes six kinds of tapas and at least five different Spanish wines, and lasts three or four hours for a cost of €59. The tour goes around Madrid’s oldest barrio, Los Austrias (south of Calle Major between the Opera and Sol metro stations) the layout of which has a distinctly village feel to it, as indeed this is what it used to be before King Phillip II moved the court here in 1561. Our group of foodies included three Texans, two Dutch, two Poles and two Australians which made for lots of interesting cross-cultural conversation around the table. 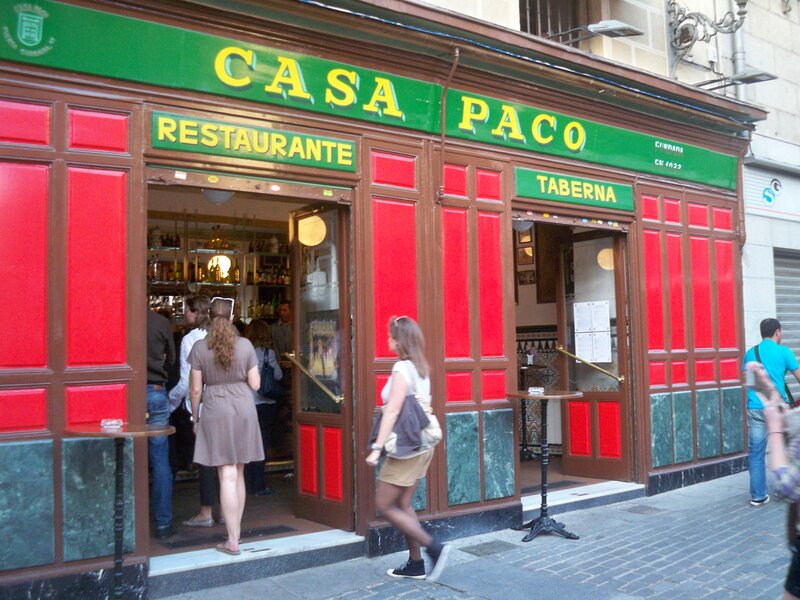 The first stop was the venerable Casa Paco tavern for a traditional aperitif of sweet red Vermouth and some excellent green olives. The name vermouth comes from the German ‘wermut’ , known as wormwood in English, a plant traditionally used for improving the flavour of cheap wines. Wormwood is also used in Absinthe, the supposedly hallucinogenic tipple beloved by French writers and bohemians, which was also available behind the bar. Wormwood contains small amounts of the chemical ‘thujone’ to which the supposedly psychedelic properties of absinthe has been attributed, leading to it being banned in many countries by 1915. In fact thujone in absinthe is not as harmful as once thought and since the 1990’s, the ‘green fairy’ has been making a comeback. The Spanish version however contains thujone to the upper limits allowed by EU law. We were also taken into the back room of the Casa Paco to see the photos of famous past clients, including Penelope Cruz and King Juan Carlos, who truth be known, both seem to get around a lot of the local restaurants. Next stop was Cantina La Traviesa for a glass of dry Manzanilla sherry, and a preliminary plate of Iberico ham and strong mature Manchego cheese. The Manzanilla was a Pasada (aged for seven years using the Solera system) from the town of Sanlucar de Barrameda where it is bottled without any chemical or mechanical processing, unlike the vast majority of sherries. It also goes exceedingly well with grilled seafood which is the house speciality here, the owner having worked for twenty five years at Mercamadrid, the world’s second largest fish market, located out on the edges of the city. La Traviesa is on Calle Cuchilleros, near El Sobrino de Botin, the world’s oldest (continuously used) restaurant since 1725 (see separate post). Ana, the chef at the next restaurant we went to (D’Fabula at Plaza del Conde de Barajas-thanks Adam) specialises in modern Spanish cuisine. She works in two-star Michelin restaurants and has won the ‘Best Chef in Madrid’ award for 2008. We were treated to her updated version of Migas, a traditional Iberian shepherd’s dish normally made of loose breadcrumbs mixed with peppers, garlic, chorizo and grapes, which can be quite hearty. This was a lighter smaller version consisting of balls of deepfried migas with a grape foam, which was completely delicious. Our final stop was Bahiana Club a wine and tapas bar with bright modern decor hidden up a side street. Here Andres presented us with a series of excellent wines beginning with a white Rioja accompanied by a plate of huge mussels in a tomato and white wine sauce. This was followed by a great red Rioja (Luberri Maceración Carbónica 2010) with amazing bubble gum flavours and a hefty ‘punch’ (the powerful final burst of flavour in the mouth that Rioja is famed for) which went very well with a brace of small and very juicy Empanadas, or more correctly Empanadillas given their size. The star for most of us though was the Ribera de Duero (2000) red from Bodegas Alion (2000) which was quite simply stunning, its notes changing in the glass and in your mouth every time you went to it. This was served with a plate of sizzling lightly seared Iberico pork, salty mashed potatoes and halved strawberries which when combined are an excellent combination with the wine. The next reds, Santa Rosa Reserva (1999) from Enrique Mendoza in Alicante and the Ribera del Duraton (1998) from Castilla y Leon, were also very interesting but the final Gran Barquero a Pedro Ximenez from Montilla, Cordoba, was so incredibly dense and sweet that it completely blew us all away. It tastes like liquid raisins and goes incredibly well with Cabrales blue cheese from Asturias in the North. It also combines well with vanilla ice cream or Cuban cigars apparently. Sadly a survey of wine merchants on the internet showed that most of these older wines are now long gone from the shelves as they have received their last 7 or 8 years of ageing in private cellars. However, Andres recommended his favourite wine merchant Santa Cecilia in Moncloa as a good place to find collectable wines. His selections for the tour were impeccable and gave all of us many unique taste experiences. Many thanks Andres!